Measurements: 2.8 x 4.75 inches; or 70 x 120 millimeters. Back of card: Veined white marble. Can be inverted if you're not too fussy. Booklet included: Yes, small, 21 pages, 2.65 x 4.55 inches, or 67 x 115 mm. Comments: The usual suits, some minor renaming of major arkana: 13: Transition, 15: Materialism. This deck is a carefully thought out reworking of basic Rider-Waite ideas, there are many subtle changes. The magician, for example, is seriously at work magnetizing/energizing his left hand though for what I don't know, as the object of his piercing stare is off the card. Some of the lines on his hand are distinct, pity I don't know more about palm reading. And the nine of cups: Usually a fat, wealthy, happy merchant. Here it's Christ at the table with a shortage of disciples & a plethora of chalices. And I'm not imagining this. Look at the rose. Does it spring from his stomach (solar plexus chakra, eg, emotional nature), or has it popped up from a chalice? If from a chalice, then remember that roses have thorns & that thorns were used as a crown & drew blood which was caught by the Chalice which was first used at a supper - a full circle symbolism. In this light, the 9 of cups shows emotional sacrifice for a greater good. Roses are also a sign of the Rosicrucians, a group of mystical Christian/alchemists. There are many such subtleties in this deck. 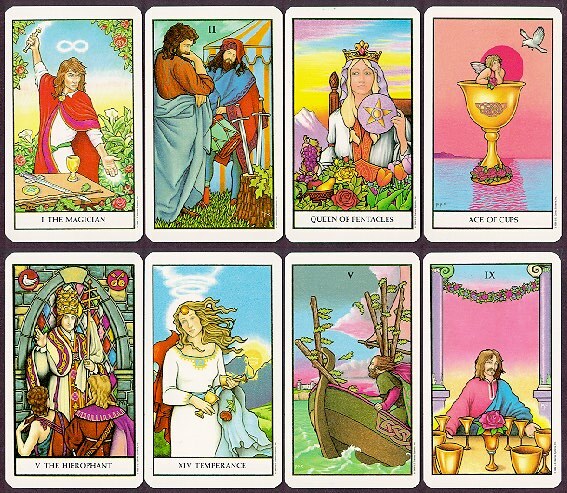 As I've said before, if you want to learn to read Tarot, learn first to look at the cards. Unlike many other decks, this one repays close study.